New Library Gift Sets in the Shop! Just in time for the holidays, we have three new Library Gift Sets with adorable vintage books! Each set comes with the bookplates of your choice, personalized as you wish. These gift sets are such treasures, perfect for your favorite teacher, librarian, new reader, or vintage book lover! Black Friday/Small Business Saturday/Cyber Monday/Thanksgiving Sale! So this is one day late, as I was busy making green bean casseroles and corn pudding yesterday, but we’re having a sale! 10% off everything site wide: bookplates, prints, gift sets, and printables! Use code THANKFUL2018 at checkout. Sale goes through Monday, November 26th, midnight PT. How cute are these printable gift tags? I've been in an autumn mood since the kids have been back in school, and even though it's still hot as blazes here in Los Angeles, I burn my pumpkin-scented candles and look forward to cooler days. I love fall! Hence these pretty fall-themed gift tags. 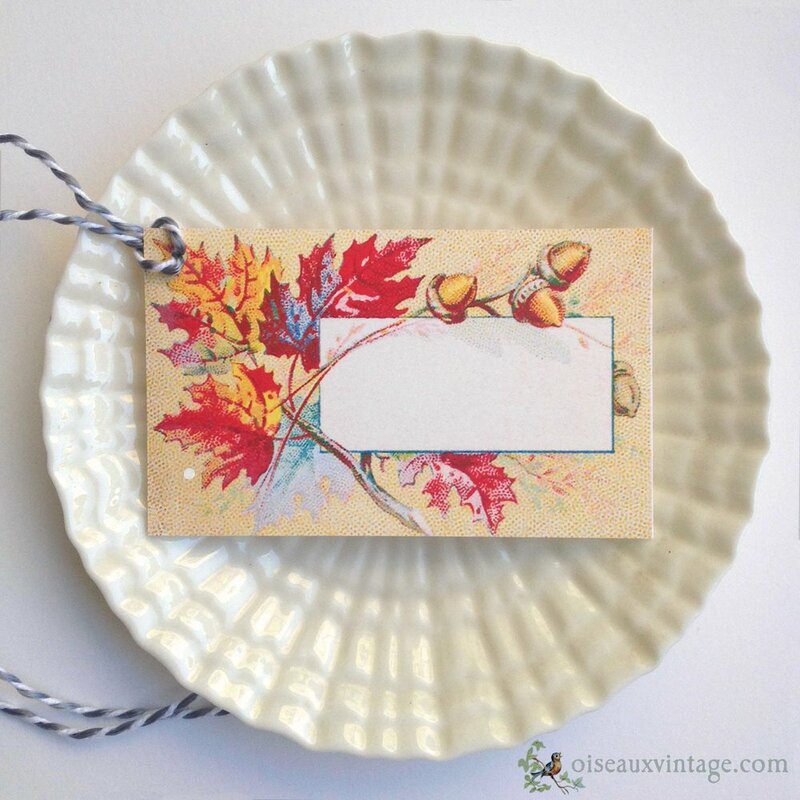 They are perfect for birthday presents and hostess gifts -- and could even be used as place cards on your autumn table! Best of all, they are FREE with purchase during the month of September. Enjoy! Oh, and Father's Day is June 17th, so you have plenty of time. Valentine's Day Cards - FREE with purchase! I shared these Valentine's Day cards with my newsletter subscribers last week: they are FREE with any purchase during January or February! These designs were adapted from Valentine's Day cards that my Grandmother received as a young child in the 1920's - her birthday was Valentine's Day (and so was my other Grandmother's birthday, how crazy is that?) - so she had a huge collection of cards covered in hearts. These were some of my favorites from the batch. They come as a PDF download that you can print on a home printer or send to a printshop - good for years to come, print as many as you like! They are also cute used as gift tags: I used a small hole punch and used baker's twine on a few of these and they look adorable. My name is Shelley, and I am the designer and vintage enthusiast behind Oiseaux Vintage Paperie. This blog is a place I like to share my inspiration, process, and news. Thank you for visiting! A Couple of New Prints! New Library Gift Sets for the New Year! Thankful to be Celebrating 10 Years: A $100 Giveaway! Vintage-Inspired Paper Goods: Bookplates, Prints, Gift Sets. Made with love in Los Angeles, CA.